When I saw that Inside the O'Briens was available on NetGalley I jumped at the chance and it did not disappoint. I read Still Alice, my first Lisa Genova novel, last month and it instantly made me a fan. Her ability to draw attention to unknown and misunderstood diseases such as Alzheimer's, in Still Alice, and Huntington's disease, in this book, are admirable. Her heavy research on the diseases, their impacts to the person diagnosed and their loved ones is very evident in her writing. This makes her characters very relatable. Reading about the Joe O'Brien and his family's ability to rally around him and the disease was almost like I knew them. They could have been my family or a family down the street. It was hauntingly real. 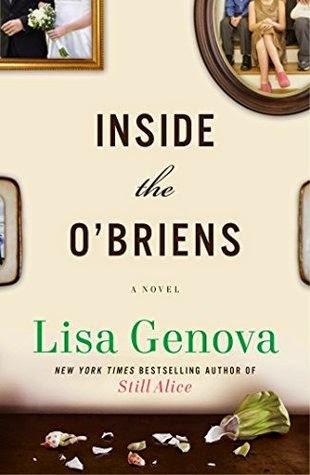 Inside the O'Briens was so captivating that I could not put it down. I ended up reading it in one sitting. Fans of Still Alice will appreciate this novel and I highly recommend it. I will definitely be purchasing a hard copy of this book for my collection. A digital copy of Inside the O'Briens was requested from the publisher via NetGalley for review purposes.